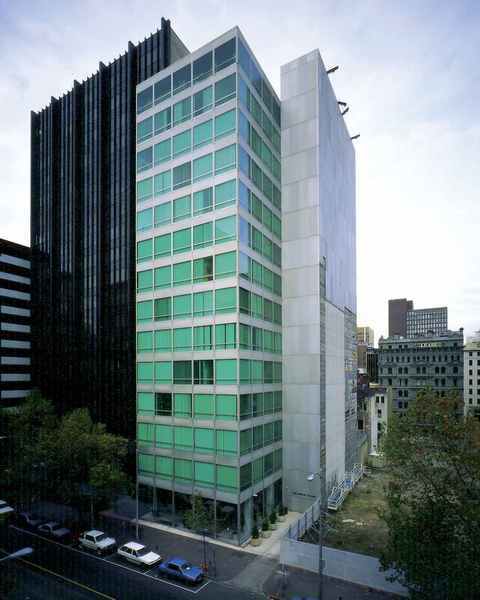 Eagle House built 1970-71 is of state significance as one of the finest examples of the developed curtain wall phase of Australian commercial architecture. Glass and natural aluminium sheet form a sophisticated "skin" over the structural frame, creating a form of pseudo-structure in place of the overt structural expression which has been seen in the first "glass box" offices such as Gilbert Court. In this it was both the prototype and the best example of a refinement of contemporary American multi-storey commercial office design, inside and outside, reduced to its simplest expression, and developed in Melbourne by Yuncken Freeman Architects. It was awarded the 1972 Royal Australian Institute of Architects (Vic) Award of Merit (General Category). Eagle House derives from such distant prototypes as Bulluschi's Equitable Building, Portland, Oregan (1948) and Skidmore Owings & Merrill's Lever House, New York (1950 -3) and provided the prototype for the designing firm, Yunken Freeman Architects later but notable BHP House and Estates House at the corner of William and Bourke Streets. These buildings plus the former Shell Building (demolished) and the AMP Building formed a nationally important commercial precinct. Eagle House's aesthetic merit derived from its modest scale, 12 storeys and 2 basements, the introduction of ceiling to floor clear galzing (plus vertigo rail) which enhance the simplicity of the design, the almost luminescent aluminium facade and its flush glazing detailing. Also notable is the skill of its core planning where service shafts were placed at the rear of the site to allow an uninterrupted facade. Major elements of the interior and ground floor lobby are intact (designer Tony Wolfenden) including the aluminium eagle sculpture commissioned for the lobby wall. File Note: Built on site of Oxford Chambers.